Cottone Auctions is a competitive art and antique auction house located in upstate New York. With average sales between $1 million and $2.5 million, Cottone has been referred to as “Christie’s in cow country” and proves that we truly do live in a “flat world.” Clientele from around the globe enjoy easy access to Cottone’s auctions with live Internet and unlimited phone bidding. Cottone strives to provide welcoming personal service with outstanding final results. The combination of our small-town, friendly attitude and the big-city prices we achieve is appealing to buyers and sellers alike. As a seller, your items do not get lost in a sea of merchandise. As a buyer, you can be confident that your items will be honestly represented. And we promise hassle-free, worry-free delivery of your items. Learn more about our full-service shipping department. Sam & Matt CottoneWe handle a wide variety of merchandise, including American & European paintings, prints and sculpture, lamps and art glass, period furniture, decorative items, jewelry, Asian arts, oriental rugs, Americana, clocks, Native American and military pieces, and much more. We are skilled at bringing property to the marketplace and reaching optimal prices—often exceeding those of the best-known auction houses. View our Prices Realized, sortable by auction and/or category, or click here for selected highlights from older auctions. Our integrity, enthusiasm, and personal attention make Cottone Auctions a top choice for dealers and collectors, time and time again. 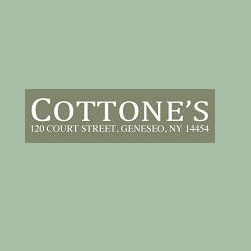 Cottone has been chosen to sell for many well-known museums and institutions, including The Strong, The Memorial Art Gallery, The Rochester Historical Society, The George Eastman House, and The Landmark Society of Western New York (all located in Rochester, NY). Auction valuations are free for single items, collections, or entire estates. Visit our Appraisal and Consignment pages to learn more about our process, or contact us with any questions.